OverdoseWhat Happens to Your Body When You Overdose? According to a report released by the Centers for Disease Control and Prevention, deaths associated with opioid overdoses are on the rise. In fact, the CDC has classified the overdose statistics as significant enough be considered an epidemic. 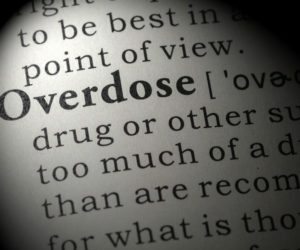 It is common when considering drug use to think about the possibility of becoming chemically dependent on the drug, but not enough consideration is given to the possibility of an overdose. You are probably unaware of what happens to your body when you overdose, meaning that you may not recognize the initial signs, which is paramount for getting the help you need in time. Depending on the type of drug being used, narcotic overdose symptoms will vary, making it immensely important to understand the signs of overdose associated with your drug of choice. At White Sands Treatment Center, we specialize in providing the ideal environment and professional support necessary to help people who have become addicted to drugs and alcohol achieve a complete recovery. It is common to work with clients who have experienced an overdose, and it has become evident that having an understanding of what happens to your body when you overdose will be vital in developing the capacity to identify the initial stages of an overdose. There are numerous signs of an overdose, and being familiar with these signs will go a long way in saving your life and giving you a fighting chance to reach a full recovery. So, Exactly What Happens to Your Body When You Overdose? A drug overdose occurs when you overload your body with drugs, whether illicit or prescription, at a rate that outpaces the body’s capacity to detoxify itself. The human body has an immensely efficient natural capacity to rid itself of toxins, and the body identifies all synthetic medications as being toxic. Unfortunately, when drugs are being consumed in high doses, or too frequently, the body cannot metabolize it fast enough, and the natural side-effects associated with the drug begin to cause harm to the body and the brain. Psychoactive drugs like heroin and Vicodin are psychoactive drugs that have a direct impact on the part of the brain that regulates breathing, meaning that an overdose can result in labored breathing. In the case of a severe overdose, you could stop breathing altogether. If you are using a psychoactive drug and you begin to experience labored breathing, you should seek immediate medical attention. Drugs like cocaine and meth are stimulants, and they present an entirely different set of problems during an overdose. What happens to your body when you overdose on stimulants is your heart rate will rise increasingly, and it is likely that the neurological interferences of the drug will interrupt muscle movement and coordination. It is also common for cocaine and meth users to have seizers during an overdose. If you or a loved one should experience any of these symptoms while using a stimulant, it is important to seek medical attention immediately. When using drugs like Xanax, Valium or even alcohol, the exact opposite occurs with the body in comparison to stimulants — everything slows down. As with an opioid overdose, the body’s natural breathing patterns can be interrupted or stopped, so any issues with breathing should be taken seriously when using these drugs. Hopefully, you never experience a drug overdose, but knowing what happens to your body when you overdose will increase your chance of getting the medical attention you need in order to survive. Suffering an overdose is a clear sign that you are in need of professional help to deal with your use of and dependency on your drug of choice. At White Sands, we provide a quality and safe environment staffed by experts who will put your best interest out front. If you are in need of assistance to help overcome a drug addiction, call us at 877.55.3470 or visit our official website at www.whitesandstreatment.com.